The single woman should not be ignored. Why? This particular sub-population seems to continue to grow. After multiple requests from the single ladies…here it is, I have found THAT person introduce you to. 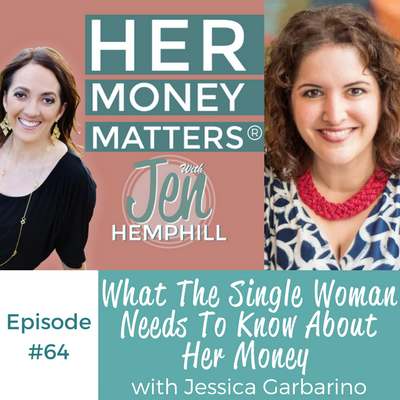 Her name is Jessica Garbarino, a financial coach for the single woman. She is the owner of the blog Every Single Dollar and definitely has a lot to say in this episode! Don’t forget to join us in our fabulous community by clicking here. Are you a single woman? What money advice or tips do you have for the single ladies out there? Be sure to share with us in the comments below! [0:00:26.3] JH: Welcome, I am so glad and grateful that you are here and hopefully you are listening to this episode comfortably within the air conditioning, especially if it’s summer for you. I know here in the DC are, it’s been unbearably hot. Of course, if you know me and if you’ve been following me for a while, you know that I don’t do well with extreme temperatures. But let me give you a little illustration of how hot it’s been so you feel my pain. Outside it’s felt like when we lived in Arizona, so for those of you that have lived in Arizona or have visited Arizona, you know how hot it can get there. But add the humidity that we get here in the southeastern states plus the Arizona heat. That’s how it has felt here. So just wanted to share that so you can feel my pain. Now I feel better. 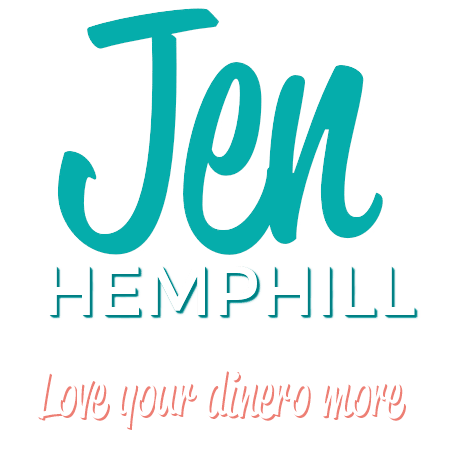 So I also want to invite you to join us in the conversations happening in our free community over at jenhemphill.com/community. Besides those conversations that we’re having in there, we’re actually going to be starting a virtual mixer, so that’s going to be a lot of fun. It’s not going to necessarily be all money talk, we’re just going to get to know each other. So how fun is that that you’re surrounding yourself with like-minded women and you’ve been connecting with them in the Facebook group and you’ve been engaging in money conversations but we’re going to take it outside of the Facebook group and we’re going to get to know each other. So it’s going to be a lot of fun. If you want to be a part of that, join us in the Facebook group. It’s again at jenhemphill.com/community. So now let’s get to today’s guest. I have a significant number of single ladies as listeners so I’m grateful for that because I feel like you’re telling me that I look or sound super young, which I’ll take that as a compliment and you have been asking me to do an episode for you. So here it is, I have found that person to introduce you to. What you’ll learn in today’s episode; we’re going to learn about her reflection on the extra added cost as a single person, she’s going to tell us about the investment that she made that literally paid when she got laid off in 2008, and she’s going to share the one key thing budgeting brings out in you and why it is even more important on one income. Then she’s going to talk about long-term disability in her thoughts on why it’s so necessary for the single woman. So let me share with you a little bit about Jessica. Jessica Garbarino is the founder and owner of Every Single Dollar,a company dedicated to helping single women navigate their world of personal finance. She realized that she was experiencing a financial hangover in the early 30’s after the lifestyle choices in her 20’s caused her to rack up debt. After paying over $56,000 of debt, she felt called to teach other single women how to manage their money, pay off debt and instill financial confidence. She offers individual financial coaching, speaks some personal finance and writes and produced video on various financial topics with the single woman in mind and Jessica lives a debt-free life in sunny south Florida. [0:04:06.8] JH: Welcome Jessica Garbarino, I’m so excited to have you on this podcast. [0:04:11.1] JG: Thank you for having me. I’m very excited to talk to you and I hope I can help out some of your listeners today. [0:04:17.3] JH: Oh I’m sure you can because I definitely have attracted some fabulous single ladies and even though I can talk about personal finance until I’m blue in the face, I can’t speak to the single woman perspective I don’t think, which I think is important. So I was, as I was mentioning to you before we started recording, I wasn’t single too much or on my own to really experience what it’s like. So I just felt it was important to have someone on the podcast that can speak to that and that is in that field and teaches single women about personal finance. So I’m definitely excited as to the conversation we’re going to have today. Well, Jessica, I’d love to get to know more about you, tell me a little bit about your money story. How did you grow up around money story? How did you grow up around money? [0:05:10.3] JG: Well, I am the oldest of seven children. [0:05:14.9] JG: Yes, and yes we have the same parents, all of us. Because I do get that question from people. So when I was growing up, money was always kind of a big deal because we had one income. My dad worked, my mom stayed at home and so my parents were always very mindful about money and I actually grew up around a very healthy financial environment. My parents used to have monthly budget meetings, they would go out for coffee and talk about the budget, my parents invested, they would talk to each other about investments. My dad kind of handled the investment side more, my mom the budgeting but they always talked about it together. [0:05:56.7] JH: Wow, that’s good. [0:05:57.8] JG: Yeah, one of the earliest memories I have about money is when I was a kid, I was probably gosh, I was probably eight or nine years old and this is when people still got the newspaper every day. I don’t think anybody gets a daily newspaper anymore. But when I was a kid, the only way you could look up your stock quotes every day was in the daily paper, there was no internet to look up, to see how your stocks or mutual funds had done. So my dad, knowing that I had an interest in finance, actually took it upon himself to show me how to read the stock quotes and his mutual funds. He actually showed me which mutual funds he was invested in. So each day when I’d come downstairs for breakfast in the morning, he and I used to like to get up early because we’re not morning people so we don’t want to be around a lot of people. We would go through the newspaper and he would ask me, “So how did my mutual funds do today?” So he would check in on them and I would get the practice of looking it up. [0:07:00.3] JH: That is so awesome. [0:07:01.2] JG: Right, and I was just hooked as a kid. I thought it was fascinating and I’ve always kind of had a love for personal finance, so it was something that kind of came naturally to me when I was younger. [0:07:12.5] JH: So what do you think helped you gravitate towards that? Was that just seeing your parents have those, I think monthly meetings? Was that saying your mom doing the budget, was it your dad looking at the paper? What do you think really led you to your interest? [0:07:30.9] JG: I don’t know because my parents, like my dad, was a communications major in college, my mom was an art major. There was no — the banking financial side, I’ve been doing a lot of research on ancestry. My great grandfather actually ran a bank in Pennsylvania and then I’ve had other ancestors that were in the banking industry. So I think I got the freakish gene that came through and kind of surpassed everyone and came to me because I’ve just always had an interest in it. I’ve always thought business and finance were always really interesting topics and subjects. So I think it was just in me, I think it was in my DNA. [0:08:09.2] JH: That’s interesting. So your dad spoke to you or taught you some things as far as teaching you how to read the investment information on in the newspaper. Were there any other money conversations that you recall or maybe with your mom or other things that they taught you growing up? [0:08:30.5] JG: I think, in general, a lot of the conversations revolved around frugality with having a large family. So we knew how to stretch a dollar. My mom on grocery shopping trips, we would try to figure out what were some of the best deals on whatever we were purchasing and going through like the weekly circulars to see what was on sale and my mom would kind of gravitate towards that. My parents were also really big into gardening, we were one of those families, those freakish families on the block that had a compost pile in the suburbs, which was a little weird when I was growing up. It’s probably more commonplace now, but my mom used to do a lot of canning so I learned about, you know, we would go pick strawberries and she’d make homemade jam and she would cook a lot from scratch. So I had learned a lot of that money saving tips when I was a kid because of the way my parents needed to live with one income and having so many kids. I think it was more of that frugality mindset that I — I don’t think I appreciated it as a kid and we can get into that more as when I talk about some of my money story but it’s definitely something I’m now embracing in my 30’s that I wish I would have in my 20’s. [0:09:44.0] JH: Got it. And what would you say is — what do you do well with money? [0:09:49.8] JG: Now what I do well with money is that I know how to sacrifice in the short term for something in the long term. [0:10:00.3] JH: Tell us a little bit about that and what you mean by that? [0:10:04.7] JG: So a lot of my friends in my age group, I’m in my late 30’s, they all have these great houses, they have amazing cars, they have stuff. Like all the stuff that kind of the Joneses all have. Right now, after paying off my debt and deciding to start my business, I realized that I’m going to have to sacrifice those things in the short term, some of those material things that maybe I want right now in order to grow my business and to have something that’s going to payoff later. So I’ve learned kind of that delayed gratification. I think I’m better at that than I sued to be because I know what the end result is and I guess I don’t care as much about the immediate wants as much as I used to. [0:10:53.4] JH: Right, and I think it also takes discipline as well. Once you get over those, that immediate. Especially at the beginning if what’s important is that immediate result or what the instant gratification, it takes discipline but I think over time and once your priorities shift and makes it a lot easier to do, for sure. [0:11:50.5] JH: Makes sense. What would you say are the challenges that you have around money? [0:11:57.9] JG: I think I still struggle a little bit with like small impulse spending. Not some of the big stuff, but I have to be careful about the small little things that can eat away your budget. When you stop at a store, Target’s infamous for this, right? You stop in for one thing and you walk out with a hundred dollars’ worth of stuff that you didn’t think you need but at the moment you thought it was important. I’ve had to really stick myself on a cash budget. From things that I’m paying like my rent and things that I can automate, I put that on auto payment but things like eating out, my groceries, I really try to pay in cash because I need kind of that mental like “this is where, this is finite, this is exactly what you can spend, this is it” so that I don’t overspend. I still have an issue with kind of that day to day spending a little bit. That’s what I’ve used to reign it in. [0:12:54.7] JH: That’s good. I know, it’s interesting how with some people cash is what they do and I know for me it doesn’t work. So it’s just interesting how our minds work so differently. Tell us a little bit, you, being a single woman, tell us how you manage — just give us a quick snippet in a pan of 30 days, how do you manage the finances at home? Do you sit down once a month, every week? So tell us a little bit about how that works if you use any, whether you use a spreadsheet, whether you use some sort of app, software, those types of things? [0:13:34.2] JG: So I’m an accountant by trade so I definitely am an Excel nerd. I love using my spreadsheet. So I have a budget, I kind of do between a budget and a forecast because all kind of forecast out the next couple of months just to see where I’m heading towards and again, that’s just part of being an accountant. We forecast that kind of stuff being in finance. What I generally do in a given month is I’ll sit down and I’ll say, “Okay, what do I have planned for this month?” Because usually you kind of know what you’re doing if you have events or things going on. I kind of have what I have is more of like a static budget of things that are kind of my givens like whatever you have to make your monthly payments on. Then, I will add in certain items that I need if I know I’m going to a party or if I know I’m going to, you know if I’m going to be out of town, I have to budget more money for travel, that sort of thing. I’ll make tweaks to that particular month. Then as I’m going through the month, I will, for most of it I’m checking kind of my bank account just to make sure all the automatic payments are coming out. Every couple of days I’ll just scan through it to make sure everything’s coming out as I think it’s supposed to in the dollar amount that I think needs to. Because that’s where you can get caught in estimating something or not knowing your bills well enough to know whether or not a dollar amount is out of whack or not. I’ve had surprises that have come up that because I’m keeping track of it and keeping an eye on it, I can kind of immediately curtail any issue with a payment or a withdrawal coming out of my account. [0:15:12.2] JH: Do you just kind of check weekly or how do you go when you check? [0:15:16.4] JG: Because right now with the, I’m working a contract job right now. I get paid weekly. So I am looking at stuff weekly because I’m thinking, “Okay, this check, I’m paying this, this and this.” so I would expect those payments to come out. So I am kind of checking every couple of days just to see that the amounts that I think were supposed to come out, are. That’s just my way of monitoring it. I’m such an app person. We’re always on our phones, it’s so easy to bring up my banking information with my app. [0:15:45.0] JH: Right, is that what you use, your banking, most often? [0:15:49.3] JG: I use it for everything. I even deposit checks, I don’t know the last time I’ve actually been to my bank. They probably wouldn’t even recognize me if I walked in the door. [0:16:01.6] JG: The only time I think I’ve gone there is if I need like a cashier’s check or a money order for something that is required for but I never go to my bank. [0:16:12.8] JH: I love our bank and the app because I can see how I’ve organized the money because I have envelope system, just a virtual one so I can see our financial goals like the things for our trips and all that other stuff. So I love just being able to — so I can look and I can just glaze, not glaze, glance at it. [0:16:35.9] JG: Sometimes you glaze over. [0:16:37.7] JH: Yeah, glaze over it. Glance at it quickly and just see what’s going on. For me, the bank app is what I use. So tell us a little bit about your proudest money moment? [0:16:50.8] JG: Well I can actually even tell you the day that it was. [0:16:54.5] JH: That proud? That’s great. [0:16:56.3] JG: I call it kind of like my second birthday and it was March 5th of 2015 when I officially paid off $56,000 of debt. So that was when I made my last student loan payment and I was so happy to make that last payment, I couldn’t believe it, I was ecstatic. That was definitely my proudest moment money wise in my life so far. [0:17:25.1] JH: That’s awesome. Well, it’s definitely one to be proud of because those student loans, we can go on about those. [0:17:32.7] JG: They followed me out of my MBA program for a long time. That wasn’t all MBA, I mean that was — like $29 of it was an MBA loan and then $13 of it was a car and $14 of it was credit cards. I had a good mix of things that were in there. [0:17:49.4] JH: Right, but you paid it off and it’s done. [0:17:53.7] JH: It’s done. That’s awesome. Who would you say influenced you the most in the area of money? [0:17:59.8] JG: Well, outside of my parents since they were kind of my initial teachers, what got me actually started on the whole money journey was, I was watching my grandmother balance her checkbook and she is meticulous. If it’s off by a penny, she goes bananas. When I was watching her, I was thinking, you know, my grandparents came from Cuba in 1962 and they gave up everything and had to start over at zero in their late 30’s. That’s really what made the catalyst for me to make a financial change and what got me started on my debt free journey. So maybe the other influential one outside of my parents and grandparents were, I mean my friend then got me started on Dave Ramsey. She was taking Financial Peace University and I jumped in with both feet like on fire. That guy got me just totally revved up about paying off my debt. So I do owe a lot to getting on that program, to getting out of debt. Now, being away from the program, there are things I agree with him, there are things I don’t agree with him. But I will say that he was very influential in me paying off my debt and actually having the motivation, at least the initial motivation to do so. [0:19:42.2] JH: Right, and I agree. I think Dave Ramsey does the job. I’ve spoken in interviews, with clients, that if they put those methods to work, it works. So if you do those steps it works. So whether you agree with anybody, and he is like one of those personalities that you really like or he antagonizes people right? But at the end of the day, he’s helped a lot of people and a lot of people have gotten out of debt just based on his teachings. So that says a lot, right? [0:20:16.8] JG: I think what he does, what’s really, what was kind of crucial for me is he really got into the emotional part of it. He really gets you revved up emotionally and that’s what the behavior change is what people have to do to get started I think. I think he’s an expert at getting people fired up about their money. [0:20:37.9] JH: Yes, absolutely. So let’s talk about, a little bit about your work and why did you decide to focus on the single woman? I know you’re a single woman but why did you think it was so important? Because of course, the concepts are the same but I know the situations and the scenarios are different for each person. So tell us about what are some challenges? Let’s start, let me re-track because I’m asking you too many questions. Tell me a little bit about why you decided to focus on the single woman and teaching them personal finance? [0:21:19.3] JG: So I think when I was going through my personal finance journey of getting out of debt. While it was great with the Dave Ramsey program, he’s definitely focused on married couples or families. I think everyone can agree that that’s his focus. That’s great, you know what? Because that’s where he comes from, that’s his perspective, he’s married, he has kids, it makes total sense. But when I was getting out of debt, I did lose motivation throughout the process and I think part of the problem was that I didn’t have anyone in the marketplace that I could identify with. In his program, he does talk about relationships a little bit but when he talked about single people, he was like, “Get an accountability partner,” and I’m like, “Great, you just didn’t address what I needed you to address.” There’s a whole lot more to it than just that because I don’t want to just open up my finances to family and friends. That’s very personal it can make for very weird conversations and make you feel very awkward around those people. So I wanted to create an environment that was conducive to the single woman, addressed her needs, addressed some of her emotional fears and worries about finances and just to have someone to be their cheerleader and encouragement and someone who says, “I’ve walked in your shoes, I know what it feels like to try to make these large money decisions all by yourself.” It can be very overwhelming and exhausting and at the end of the day, it’s all on you and that’s a lot to carry I think sometimes and I don’t think people realize that when they’re talking about personal finance to women. [0:23:00.4] JH: I agree. Just hearing you talk, I definitely agree. So what would you say are the needs and some of the challenges that single women faced that we don’t necessarily acknowledge as a general population? You start getting into that and they have to really think about, “What would happen if something happened to me, what would the consequences be?” The other thing I talk about too is long term disability. Yes, you may have family that can step in and help you but who is going to take — who is going to cover the cost of taking care of you? Which is why I strongly, strongly urge single women to get long term disability. I carry my own policy, my own private policy myself because it’s that important. It’s not the least expensive insurance but let me tell you that it’s probably even more important than the life insurance policy. So there’s things like that that need to get addressed through a different filter than you would if you were married with children, you just think about things a little differently. I think the other part of it is I think women are very uncomfortable talking about personal finances, especially when they’re by themselves and have no one else to bounce anything off with. I had a client that I was talking to a couple of weeks ago and she said, “I’ve told you more than I’ve told my financial adviser. I’ve opened to you more.” Because it was almost more like girlfriends having a conversation than feeling like it was some sort of formal thing that they feel like they need to have all the information. [0:25:03.9] JH: Right. It’s so crazy that you just mentioned that because in the group I was asking what kind of questions did they have for you, and one of the things that she mentioned was that, you know, one of the reasons she loves the group because as a single woman, because she doesn’t have people to talk to about the financial stuff. So it just feels helpful to talk about things and get a second opinion and learn from others. So definitely, I love that. Because I do have some questions, I don’t know if you addressed all the challenges that you wanted to address? [0:25:42.4] JG: I think the other thing is that women are definitely more relational and emotional when it comes to a lot of these, you know, when it comes to money. Just from observing my dad, he was definitely more, I don’t want to say practical. That’s a horrible word, but he could kind of divorce emotion from it. Where I think, we as women, think about retail therapy. You talk about things like a lot of the activities that we spend money on as women revolve around social situations like going out to eat or socializing, we’re very social creatures. So I think part of it is that you have to address the emotional side of it and recognize that it’s not all just head knowledge, there’s heart knowledge and there’s behavior that goes along with addressing finances, especially when you’re single. [0:26:33.1] JH: Absolutely. And at the end of the day, you don’t know, well maybe you plan to be single for the rest of your life or maybe you don’t but you're dependent on you and like you said, the long term disability, potentially the life insurance, I think the emergency fund is more important than ever. [0:26:53.4] JH: Just because if something happens, it’s your income, that’s all that you’re reliant on. So I think you definitely brought up some great points. So tell us what would be your best practice or practices for living in this “two income world” on one income. [0:27:15.8] JG: That’s an interesting question because I know people that only live on one income as a family, so I’m not sure if there’s an expectation about how people have a certain level of lifestyle. [0:27:29.3] JH: Right, that’s what I’m thinking. [0:27:30.1] JG: I guess it also depends on career choice too. I definitely see there are women that have careers that generally have lower incomes, at least some of the ones that I’ve worked with and so you’re definitely having to watch your spending differently. I think you have to be a little more careful. I often think sometimes being single, there’s almost an extra added cost too because you’re not spreading it over several people, you just have one person who is absorbing all of the cost. Whereas if you were in a relationship and you were married or whatever and you had two incomes coming in, you could maybe spread the costs a little differently. So I guess I’m not really sure about that question. The only thing I would say is that you need to — when I was getting out of debt, I had an extra job. I actually took on an extra job because A, I had time and B, I wanted to get out of debt a lot faster. So I think there are ways too that if you find you’re really passionate about something, I have a client right now, she teaches in a grade school but then on the side, she has a photography business because she really enjoys it. It’s a great way for her to supplement her income. So I guess you can think of it as how do you want your life to be and then you need to kind of back into that from an income standpoint of how you’re going to get there. It doesn’t have to be with one job. I know people who have several jobs who are very happy because they have a variety of interests and they have a variety of interest and they have a variety of things going on in their life. I think you can really kind of design it, however, you want it to be. I don’t think there has to be this status quo of what an income looks like. [0:29:04.6] JH: Right, and I think it’s also the perspective. Like you mentioned the lifestyle, what your perspective is on what this income should look like as well and as you mentioned, I know you mentioned something very interesting, you mentioned that it’s like you almost have an extra added cost for being single because it is just you. So if you have a mortgage payment, it’s all on you versus you and a spouse or a partner, so definitely. Now has there been, because you’re on one income, has there been a decision that you’ve made that has been beneficial but at the time maybe sounded irrelevant or maybe it was a risky decision but it was a good decision in the end? Based on that you just were relying on that one income. [0:30:02.1] JG: I guess I’ve always been so — I don’t know if we as women have a little bit more of this need for safety and security. But I’ve always kept like one eye — I never kind of stayed stagnant in a job. I know that in corporate America, your job is never totally secure because there’s always going to be layoff and there can always be something that happens. So I’ve always been very proactive in trying to network and keep connections so that if something did happen, I would have something, a network to fall back on. I will tell you I had a kind of a very scary moment that I didn’t, but this didn’t catapult me into trying to pay off my debt but I was laid off in 2008 like a lot of people were. Suddenly I was faced with all of these bills, I still had all my credit card debt, my student loans, this was definitely before I started paying off my debt. I had this panicked moment but the great thing is because I had invested all this time in networking and getting to know people and kind of treating people the way I would want to be treated and always kind of doing more above and beyond, it came back to me with people offering me all sorts of leads and connections on jobs and I literally landed into a job as my severance was running out. [0:31:21.7] JH: Wow, that’s beautiful. [0:31:23.0] JG: Right. So I guess maybe that whole networking side was part of it because I think a lot of people would look at me and go, “Oh you're just,” I thought kind of it at the time too, “I’m just having fun, I’m meeting people, I’m very outgoing and I like to talk to people.” But man did that save me in the end when times got tough and I needed to find another job. I think it moves beyond just your personal finances but your career part as well. [0:31:49.8] JH: Right, I think you brought up, just a key point, that’s not necessarily just for finances but obviously it worked to your favor but just connecting with people in the relationships that you have with people, are just so important. Just to have those connections, the relationships because you just never know, obviously it helped you. You invested your time in those connections and those relationships. So I think that’s beautiful. Now, because it is just you, what do you say about budgeting? If you have a — it’s just you, you have your income, you’ve got maybe it’s just some simple expenses, do you have any specific rules on budgeting that you use or do you feel like if it’s just a simple, the income and just some expenses, is it okay not to budget? [0:32:47.6] JG: I think what budgeting does especially for a single woman is it makes you pay attention because I think if I would have paid attention in my 20’s to what I was spending. I would have made a lot different choices. I was very disconnected, I didn’t do a budget. I would create budgets and then not look at them. I was great at creating budgets, I was really bad at following through with them, this is the accountant ,right? Do as I say and not as I do. But I think what it does is it forces you to pay attention because you can have things that come into your financial life that was not expected and if you’re not paying attention, you’re not even going to recognize it and then all of a sudden you’re overdrawn on your account and you wonder what the heck happened. For example, like when your insurance rates go up and if you’re not paying attention to the emails coming in that are notifying you that the rates are going up, you could be in for a big surprise. Like last year I took a look at my rates and I thought, “This is insane, my car insurance keeps going up.” Then I finally went out and shopped it and I saved $1,800 this past year just by being aware and being cognizant of what was happening with my finances. It also helps you to pay attention like when you have rent increases when you have just increases in daily life and it kind of gives you a good track record to see kind of what’s going on in your life because even if you think you have a simple budget, life will come at you. It will. I don’t care who you are, life is not perfectly static where it’s going to follow your budget every month. That’s just not going to happen. So I think budgeting is even more important when you’re single to make you pay attention to what you’re spending. [0:34:28.0] JH: I like those points. I really love those points, especially your point on being aware of when your car insurance was going up, so that way you can shop around and save yourself some money before it went up. So that is definitely, it makes you pay attention, I like that. So how about, let’s talk about negotiating, as a Latina myself, I love negotiating. So what are your best tips on negotiating whether your salary or whether maybe some lower rates for a credit card, other money related savings, what kind of tips do you have? [0:35:09.1] JG: I think where I’ve excelled in it is more on my career side. 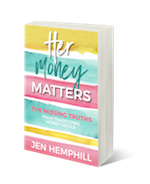 You need to know, especially in the job market, you need to know what your worth out in the job market and I think a lot of women don’t do their homework to find out what really is the going market rate. The employers sometimes, and I don’t know if they’re trying to do it purposely or not, but I think some companies don’t think that women are doing enough of their homework and they’re probably not. So if you go out in the marketplace, you find out what — there are lots of resources nowadays. You go on to something like Glass Door or you can even go into some of the job search boards and you can find out what salary certain jobs are commanding. I think having that information helps you when you go into the negotiation process. I would say, never take the first offer, you should definitely do some back and forth in negotiating, and don’t always look at it as just the salary. I think people get hung up sometimes just on the salary part of it. I think you need to look at its’ entirety of what they’re offering. [0:36:14.0] JH: The benefits, yup. [0:36:16.3] JG: Especially when it comes to healthcare. That is a huge piece that could make or break what you’re moving toward. Because I’ve been in situations where I had a job opportunity, it sounded awesome, I was making more money and then I looked at the benefits and I was either getting worse benefits or they were more expensive. It just didn’t make sense for me financially and I actually used that as a leverage point when I came back to negotiate. I would say, “Look, I know you’re giving me, this is what you’re offering as far as my salary is concerned. But I have to tell you, these healthcare expenses are a lot higher than what I was expecting. So what can we do to make this so that it works for both of us?” I don’t think you need to play like hardball but you just have to be firm in what your expectation is from the company. You also have to be willing to walk away. If they’re really not going to — it really should be a win/win situation for both parties, and if it’s not going to be then it wasn’t a good fit. Bottom line. [0:37:15.4] JH: Absolutely. I think with negotiation, for me, it’s always offering gratitude for what they already do or what they’re offering. Then from there, this is, “I appreciate blah-blah-blah, but what can you do because of, what else can you do because whether maybe it’s a customer setting, whether a credit card because I’ve been a great customer for X amount of years. If it’s in a job setting because I’ve had X experience,” use those leverage key points on to help you negotiate. I think offering that gratitude, “I appreciate blah-blah-blah,” and then going from there is so helpful. I know it’s helped me a lot. So this has been great Jessica, I think the single ladies listeners are going to get a lot out of it and so I really appreciate this. So as you know, this podcast is all about making money simple and taking control of it. How would you finish this sentence? Her money matters because _____. [0:38:20.6] JG: Because it’s your life to live and as a single woman, you have a lot of choices to make. So you do not want to let your spending dictate a life that you don’t want to live. [0:38:33.6] JH: Perfect. I love that. Well, Jessica, this has been great, I will be sure to include in the show notes where to find you because I know they’re going to be wanting to look at your website and connect with you more, read your blog post, all that good stuff. So thanks again for joining me Jessica. [0:38:52.7] JG: Thank you for having me. [0:38:59.7] JH: She was fabulous right? I hope that you enjoyed hearing from Jessica as much as I enjoyed talking with her. Now I had really one big take away. She gave some fabulous information, but there was one key takeaway that I want to chat more about with you. Before that, I wanted to give a quick shout out like I usually do because I love my community and I love to give some recognition to those in the community. Today’s shout out goes to Victoria and she’s a member of our free Her Money Matters community, she’s been super helpful in sharing the community with others because she loves it and she shares with others which is fabulous. She’s a great participant, she asks great questions, she was on the webinar recently, asking some great questions. We did a Q&A in the Facebook groups and she was in there asking questions as well. So I just wanted to say Victoria that I do appreciate you and I enjoy having you in the group. So about today’s takeaway from my chat with Jessica, it was about her investment of time. Remember if you recall in our chat, she spoke about how she was building relationships and how that literally paid off for her. Meaning she was laid off in 2008 and shortly afterwards, when her severance pay, I think it was, was going to be going away she was offered a job and it was attributed to some of those relationships that she had built and now why do I bring this up in a podcast that we talk about money? The reason why I bring it up because it’s important. Those relationships, just building those relationships, it helps not just find a new job or those types of things but it gives you that confidence, it gives you — you’re able to speak better in the sense of let’s say you need to negotiate a better credit card rate. It gives you that confidence to call up the credit card company and talk with confidence when you’re speaking to that representative. There are so many things with relationships, with talking to people and having that confidence. So it wasn’t just about building the relationships, it was about her confidence that helped her build the relationships as well and she was, because she wasn’t afraid, right? So that helped her get another job, especially at the most critical time when her severance pay was just kind of almost gone, right? So I just want you to keep that in mind about building those relationships about having that confidence is really what it is. Is having that confidence to talk about money, having that confidence, to build relationships. There are so many things with confidence, having that confidence to know that you are going to get things done, that you're going to get your stuff together, you’re going to achieve those goals, that you can achieve those goals that you want to achieve. Whether it’s taking more vacations, whether it’s getting out of debt, whether it’s making sure that your retirement is funded how you want it to be. There are so many things and confidence really lies at the baseline for that. You have to have that confidence and in order to have that confidence, you have to take that action, right? So once you take that action, whether you make a mistake, it doesn’t matter, you pick yourself back up and you get to it again and once you keep doing that, it’s going to give you more and more confidence. So that is my little rant, that was my takeaway and my little rant off the takeaway that I had with Jessica. Because notice that she was very confident in how she spoke and what she spoke about. So that is basically a wrap, I appreciate you being here. Again, if you haven’t joined us in our community, do so, what’s holding you up? We have fun in there, I’d love to have you in there. You can go to jenhemphill.com/community and next week starts the month of September. I cannot believe that and it’s back to school time over here, yay! I know some of you who have kids, already have kids in school but over here, it’s not until September. So we’ve been waiting patiently. Next month in the month of September, we’re going to be talking about First Generation College students, student loans but we’re not just talking about college, we’re also talking about kids, teaching kids about money, we’re going to be discussing allowance, how do you handle allowance? Because that is something that I’ve struggled with or still struggle with. But we’re going to talk about that, those things as well. So that is all in September and I want to thank Jessica for joining us, for sharing your knowledge, I really appreciate that, be sure to go to the show notes on where to find Jessica over at jenhemphill.com/64. Thanks again for joining me today and I will talk to you next week on Thursday.